I am so glad to hear you have tried this! I recently just heard about this for the first time and found it interesting…and as anything baby related…surprisingly very controversial! I know there are all sorts of age appropriate pros and cons but selfishly, the idea of a baby that feeds themselves from such an early age, sounds like I could get a few extra dishes clean! 😉 Looking forward to hearing how you like this strategy. Pros: Baby is content while mommy and daddy eat dinner! This one is key. I don’t have to worry about simultaneously feeding both of us or keeping her entertained. 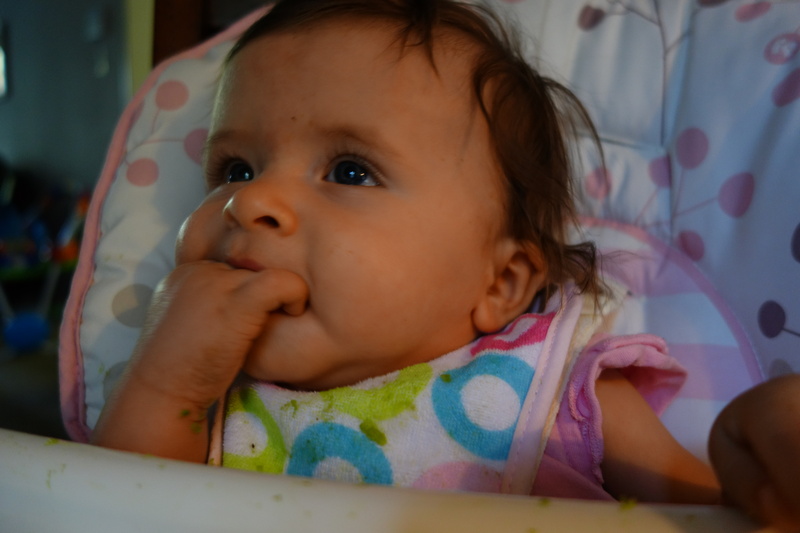 She enjoys picking at her own food and working on her coordination to get it in her mouth. 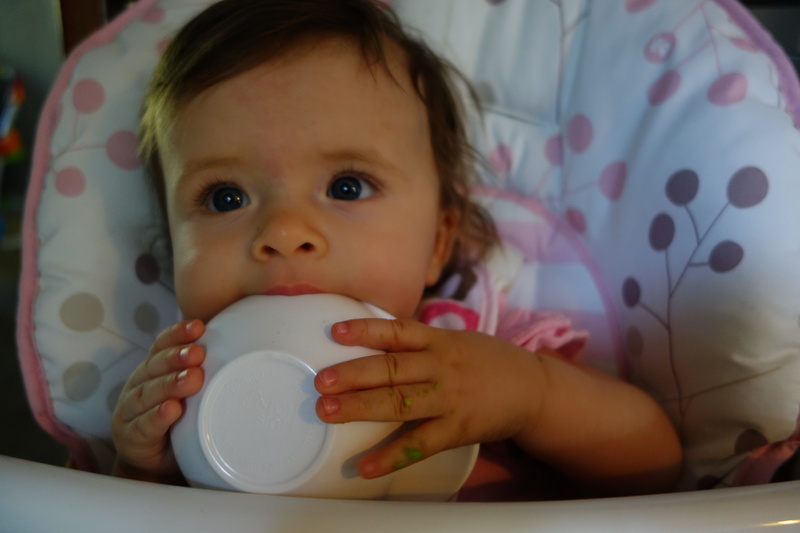 I also feel like she’s not crowding out the nutrition of breast milk by overeating something I would be feeding to her. Instead she (or her coordination!) decides how much food she gets. 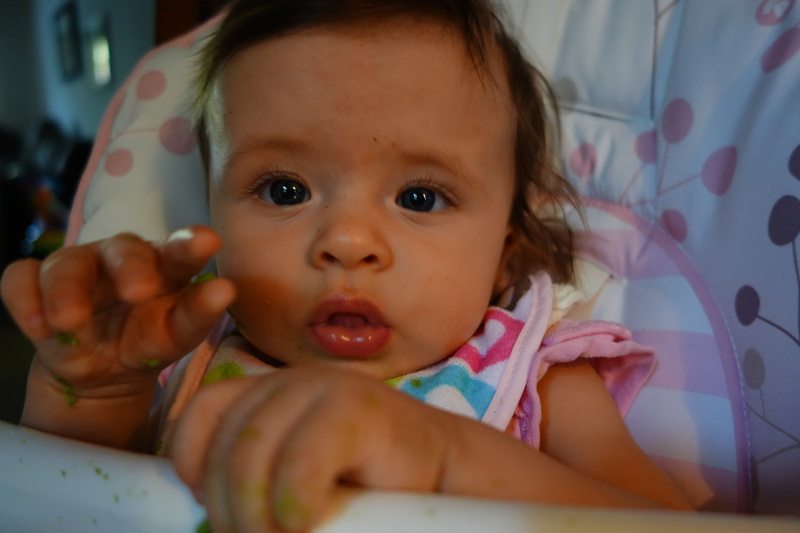 She’s happy with it and it is allowing us to introduce solids slowly, which is a major plus. Also, it is so easy to prepare, I just grab an ingredient we’re eating with our own dinner (avocado, cucumber, sweet potato, etc.) and make sure it’s in a size or cooked form she can access independently. She’s also already getting pretty good at using her own spoon! Pretty cool! Cons: Definitely messier than spoon feeding for now. A big wipe-able bib and just a diaper seem to make the clean-up a lot easier, but she still manages to get it in her hair. She and daddy clean her up after dinner, so that part is nice, they bond and I get a moment to take care of our kitchen. The only other con we’ve come across so far is the worry about choking. We are really careful only give her tiny bits of soft food but even so she gags a bit from time to time which makes my mommy heart go crazy! All-in-all, I’m so happy I discovered it. Like anything in life, I’m finding that a mix of strategies works well. I still like to spoon feed her a little here and there to get her probiotics mixed into her diet and to keep the process a little cleaner when we visit other people’s houses! Thanks for the info! I really find the concept fascinating! Now we have more to chat about the next time we hike! I really appreciate learning from your new mommy adventures. I think we both have a similar outlook in life on figuring out what works best for our unique family and situation!